Protect concrete substrates from Carbon Dioxide Deterioration with Anti-Carbonation Paint Coating. Weathering resistant, elastomeric and UV stable, Anti-Carbonation Paint Coating prevents the ingress of Chlorides, Carbon Dioxide and Acid Gases to substrates such as concrete, brick, and natural stone. 100% breathable and gap bridging this anti-Carb coating can be used on all clean concrete and masonry surfaces such as car parks, bridges, subways, high rise flats and roofing. Simple to apply and available in any RAL or BS colour Anti-Carbonation Paint is made to the highest of British standards. Primarily Anti-Carbonation Coatings are used to protect Concrete substrates from the ingress of contaminants such as Carbon Dioxide (Co2), Sulphates, and Sulphur Dioxide (So2). These are suspended in the air and fall onto external surfaces carried in rain water. If allowed to ingress into porous reinforced concrete they can do a great deal of damage causing Alkail-Silica reaction more commonly known as concrete cancer which causes concrete spalling. The application of an Anti-Carbonation Paint will prevent any moisture ingress by weatherproofing the masonry surface and stopping the waterborne Carbon Dioxide and Concrete Rebar Reacting. The best Anti-Carbonation Coatings (like the one above) are UV stable and offer around 10 years Anti-Carbonation Protection and Weatherproofing. 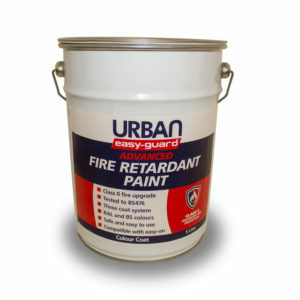 For added protection in Graffiti Prone areas Anti-Carbonation Paint Coating can be over-coated with easy-on anti-graffiti coating. This will further improve the properties of the Anti-Carb paint, extending it’s life expectancy to 20 years and giving the substrate a “True Permanent” graffiti resistant, washable finish.